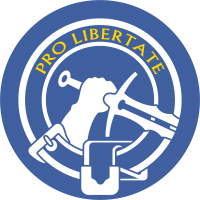 “Pro Libertate” (For Freedom). Motto of the Wallace clan. Sir William Wallace (1272? - 1305) Scottish national hero, proclaimed “guardian of Scotland in name of the king”. He distinguished himself as the organizer of the Scottish resistance against the English King Edward I. His feats were a famous theme for Scottish epic poets. Wallace took advantage of his knowledge of the terrain and the peculiarities of his eminently light troops in order to achieve offensives that forced the English back and gained brilliant victories, even coming to ravage the north of England. He was executed in English territory after having been taken prisoner. 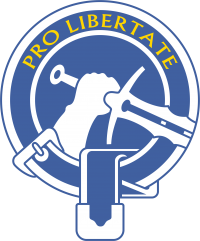 The intention of the Project “Chieftain”, which was developed privately by ALEPH with the support of PanOceania and Yu Jing, was to recreate a figure characteristic of the Scottish nationalistic spirit to introduce it in Ariadna in order to fan the flames of Caledonian independence. As a force of discord, it would try to divide to the different Ariadnan communities, leading the Caledonians to undertake a series of annexation and conquering campaigns. In that way the internal conflicts and the civil war would debilitate Ariadna, and discredit them before O-12, paving the way for the unrestricted entrance of PanOceania and Yu Jing on that rich planet. Wallace was sent to Ariadna in a furtive and non-recoverable personal drop capsule. Upon re-entry from polar orbit, the most unprotected but also most complicated access that any planet could have, it encountered a strong electrical storm. The Recreation lost control of the vehicle, crashing in the subarctic zone on the northern Ariadnan continent, five hundred kilometers from the predicted landing point and in the heart of Antipode territory. A normal man would have died with the force of the impact, but Wallace is anything but a normal man. He survived, although he received a brutal head wound which damaged part of his wetware and destroyed his capacity to communicate with ALEPH. Suffering from acute shock and partial amnesia, Wallace wandered lost and disoriented throughout the region, killing whatever Antipode hostile was in his way. When he had reached the end of his strength, he was found by a group of Caledonian hunters, who took him in, confusing him with a renegade Cateran. In this way, Wallace was taken in a semi-comatose state to the Caledonian town of Inverloch. There he would recover quickly from his wounds, although not from his amnesia, remaining incapable of remembering his mission or his origin. Nevertheless, before he could begin to worry about his situation, the Antipode attacks on the colony began. It was a series of retaliation incursions for the slaughter caused by the Recreation, which had broken an already fragile truce. And in the intensity of the combat the legendary William Wallace was reborn. The tenacity, resolution and bravery that Wallace demonstrated during the battle deeply impressed the Caledonians. Weapons in hand, he would defend a whole section of the town, assuming with expertise and strength the command of the entire defense, throwing back the numerous Antipode assaults and organizing hunting squads to track the survivors and prevent their reorganization. Wallace had saved the settlement. He was the hero of the colony, but he was also the one who had provoked the attacks, and he had to answer before the Chamber of the Clans and to clarify his identity. His superhuman qualities made the members of the Chamber suspect his extra planetary origin, which is why they required the counsel of the "cultural attaché" of the Nomad Commercial Mission, the cover of the local Black Hand operative, who identified him as an ALEPH agent. But Wallace had spent too much time disconnected from the AI and its continuous updates. During his stay amongst the Caledonians, he had returned to his origins and it did not have the slightest interest in recovering the lost memory, nor in returning to be an ALEPH marionette. The Recreation was subjected to a very delicate operation, by Nomad technicians, who mutilated all systems dependent on ALEPH, applying the knowledge obtained in the “Avicenna Operation”. Once they were assured of Wallace's capacity for independent thought, the Nomads, with a black sense of humor, pressured the Ariadnan authorities into taking advantage of the abilities of the Recreation against its own creator. There could not be a better revenge against ALEPH, nor did anything better suit Wallace's character than to turn it into a symbol of the freedom and autonomy of Ariadna. Assigned as a tactical officer in the Highlander Army he, after a difficult beginning, integrated perfectly into Caledonian society. At the outset, and because of his origins, he was considered self-serving and he lived under the dark shadow of treason. Because of this, he was involved in more honor duels than any other officer in the army. In those times he was challenged to man-to-man combat by champions from most of the Major Clans of Caledonia, and not one of them managed to defeat him. Wallace knew to assert himself first with the force of his arm, and later, gradually, with diplomacy, cleverness, and bravery, winning the confidence of the leaders of the Chamber of Clans. Wallace has been recreated with an updated tactical knowledge for modern combat, adapting himself to the more recent techniques of war, in which he is an expert. Leadership is innate in him, but his greatest virtue is that he possesses the heart of a warrior. He is able to imagine the riskiest battle plans and to see them through personally. His quick intelligence and his incredible vigor are extraordinary. He radiates an animal-like energy that lends him a sense of something wild and untamed. In combat he is unstoppable, his improved body allows him to always advance, ignoring the enemy projectiles and demonstrating his predilection to hand-to-hand combat. 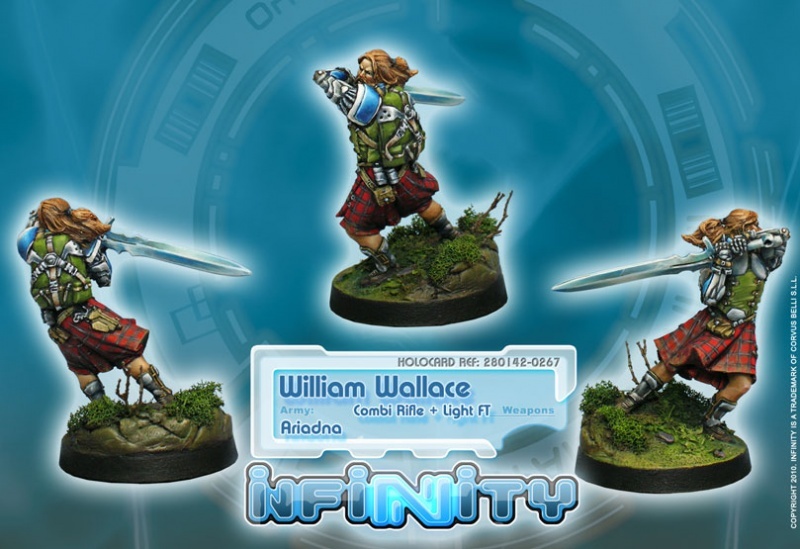 Wallace's military history is as long as the blade of his Claymore sword, distinguished especially during the Fourth Antipode Offensive and the Smuggler's Wars in the Ariadna Exclusion Zone. He has gained his rank and position through persistence, fierceness, and that tenacity so characteristic of the Caledonians. Now, after several years of continual service, one recognizes in him a brilliant, terrible, troublemaking commander, who is able to extract the very last drop of determination and courage from his seasoned Highlanders, of which he feels immensely proud and always leads from the front line of battle.